A question asked by nearly every Darwin Award winner. Kidd: It's fine. Half a shift. What's the worst that could happen? Mouch: A question asked by nearly every Darwin Award winner. 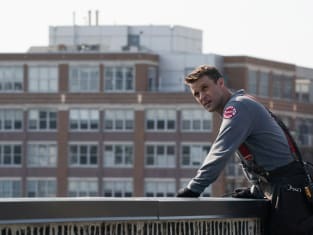 Chicago Fire Season 6 Episode 3: "An Even Bigger Surprise"
Permalink: A question asked by nearly every Darwin Award winner. Mouch: What is he doing here? Herrmann: How should I know? I'm not part of this cockamamie plan! Permalink: How should I know? I'm not part of this cockamamie plan!